This last installment of Back to School supplies brings to a close the Executive Essentials foray into the world of education at the close of this great 2011 summer. So far we have taken a look at backpacks, messenger bags, laptop sleeves, pens, pencils, alarm clocks, and agendas. Not only that, but we’ve taken a hard look at the sales that make going back to school affordable while not skimping on style. Math is one of those school subjects that you either love or you hate. If you love it, it’s because you get it and you’re your good at crunching numbers. If you don’t, you suffer for 8 years learning how to multiply and subtract imaginary numbers to come up with the gravity of planet that no one’s ever seen. I may be projecting here. Regardless, the one section of math that I personally loved was geometry. Perhaps that is why this Waterford Kilbarry Rhombus Ballpoint Pen in Titanium caught my eye (a rhombus is a quadrilateral where all four sides are the same length). 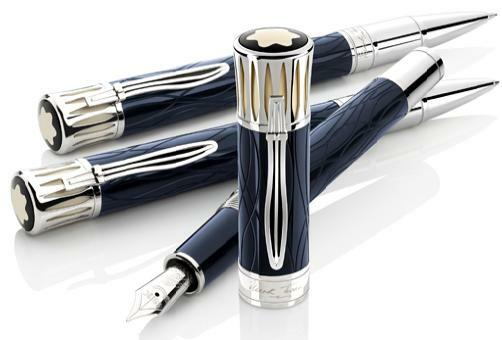 This pen features a metallic titanium color with a guilloche pattern. The designed clip, nib, and top of the pen are all shinier than the barrel to provide contrast and give a modern look. The guilloche pattern provides a good sensation to touch. In 1982, Thomas Dolby gave the world, “She Blinded Me With Science”, a song that played off a British expression that meant to purposefully confuse someone with an overdose of facts and 5 dollar words. The song itself was a thin piece of fun that peaked at number five on the Billboard charts in the United States. And although much more series, real science can be just as much fun and intriguing as Dolby’s single hit. Nothing shows that more than the Acme Science Rollerball Pen emblazoned with Da Vinci’s Vitruvian Man on the outside. This entertaining pen from Acme Studio is made up of a high gloss peach colored resin and is a high-quality writing instrument. SCIENCE! When it comes to the world of master painters and expressive paintings, Vincent Willem van Gogh stands out amongst the pack. Obviously, a name that rings familiar with those around the world, Van Gogh’s expressive paintings have inspired all who have come after him. This Visconti Van Gogh Maxi Rollerball in Tortoise is a tribute to his talents and techniques. The Van Gogh Collection is the result of a special manufacturing process called “Press Mould”, developed by Visconti, which offers a fabulous array of exciting color combinations through a mixture of natural resin and vegetal components. The vibrant colors of the swirled resins still retain the look of fresh paint awaiting their turn on an artist’s pallet. The color patterns each vary from pen to pen, recalling the beautiful impressionist paintings of Van Gogh himself. Shirts versus skins is the common way competitors in impromptu bouts of competition are segregated in gym class. In most sports, the larger the person, the more desirable they are to have on your team. Football, basketball, baseball, soccer all rely on strength first, skill second and speed last. But, there is one team sport where tiny wins out against pure, brute strength and that is dodge ball. In this ridiculously fun game, the tiny amongst us reign supreme. Harder to hit, typically faster, dodge petites time to shine. In that theme, there is no other pen that can out small the Yafa Poquito Ballpoint Pen. This little dynamo even has a twist action to release the ballpoint for writing. And, we all know that a good twist at the right time can mean the difference between being missed or being beamed by a hard rubber ball. Recess is perhaps the all time favorite hour of nearly every student who has ever attended class in grades K-8. Lunch takes a close second. But, recess is all about cutting loose and hanging with friends. It’s about talking, running, flirting and generally trying to make your friends laugh until they can’t stand it anymore. The Monteverde Riviera Rollerball in Yellow is perfect example of fun writ large. This specific pen comes with two refill choices. There is a fineliner that features a built-in spring-mounted fiber tip and also a smooth-writing rollerball with liquid ink. Its vibrant color and red, blue and silver trim can brighten any day. That is until you’re called back in for history in 5th period. Go ahead and take the time to bring your education to another level by looking at all of the great back to school pen ideas that Executive Essentials has in their catalog. It’s a cornucopia of writing instruments that can turn your back to school season into a year of education and fun. It’s Halloween and that means tricks, treats and getting dressed up as your favorite character. As the father of two small children, I understand the value of a well conceived and executed costume. I understand the amount of thought and ingenuity it takes to craft a costume that looks and feels like the character, idea or event you are trying to become. In our household this year we ended up with a zombie wizard and a devil, but only after cycling through a month and a dozen other characters such as, ‘a shooting star’ (complete with holster and pistol) and ‘box guy’ (an easy costume to put together as you can imagine). The fact is, coming up with a good costume idea can take folks a long time. Many people reach back to the last year of pop culture and news events to come up with a quirky, fun costume. Others look into their favorite books or TV shows to pay homage to the decades past. Here at Executive Essentials, we would like to offer up some last minute costume ideas ripped straight out of our online catalog. Because within the pages of our site you can find a wide variety of characters, ideas and events just waiting to be brought back to life. We had a bit of a Beatles month here at Executive Essentials. Mainly because there are some great commemorative pens from Acme and Montblanc that we wanted everyone to know about. It makes sense to suggest John Lennon as a costume this Halloween. To transform yourself, simply find a pair of circular, blue tinted glasses, a long hair wig, a poncho (rainbow colored if you have it) and some bell-bottoms and you’ll be good to go. If you have a guitar you can carry around easily that would help, as well as a button or sign that says, ‘give peace a chance’. Visconti Pens has an exciting pen line out right now that pays respects to post-impressionist painter Vincent Van Gogh (more on this pen line next month!). 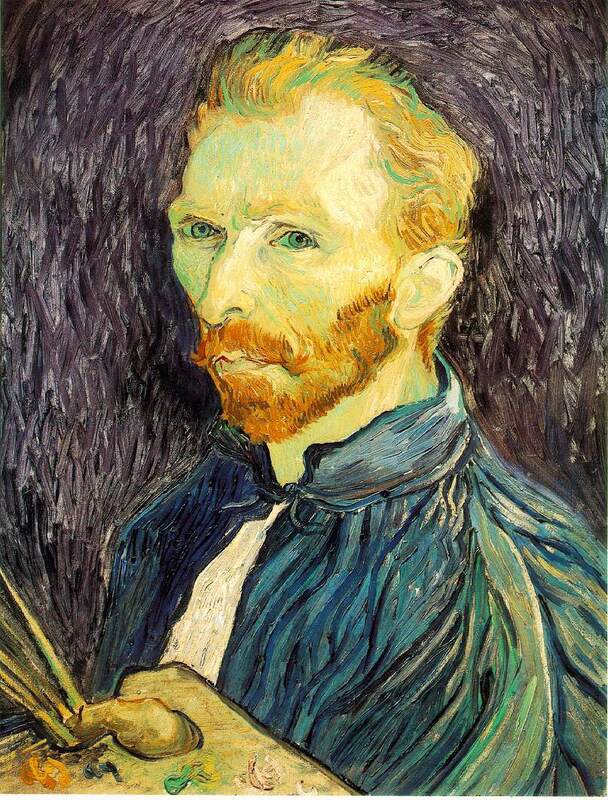 Van Gogh is known for his work that captures honest emotions that are as raw and jarring as they are beautiful. The Visconti pen line is as vast and gorgeous as Van Gogh’s work itself and is a great inspiration for a costume idea. When working on your Van Gogh costume it’s important to hit the high notes. Besides his paintings, Van Gogh is most notable for having cut off his ear in a fit of depression, wrapping it in newspaper and giving it to a prostitute named Rachel. Find yourself a depression era suit jacket and plop a few paint-brushes in it. Bandage your left ear and wrap up a small package with newspaper and label it Rachel. Viola! The absolute king of rock and roll comes in a variety of sizes and shapes throughout the many stages of his life. Acme has done a great job of capturing all his phases in their Elvis pen line. For Vegas Elvis, you’ll need a Rhinestone jumpsuit and a small pillow to accentuate his rotund features. Rhinestone jumpsuits can be difficult to find, so I suggest going for Elvis at the height of his career. Don a suit and tie and give your hair the wet, Elvis flip. A guitar made out of cardboard will do if you don’t have the real thing handy. The real feature of young Elvis is the voice and the moves. Practice these before you go out and you are sure to be a hit. With the masquerade Ballpoint Pen, Cross has created a highly festive pen that captures the fun and excitement of a masquerade ball. A masquerade is an event where the participants attend in costume wearing a mask. The mask can come in many varieties, but a common type is a white, smooth mask that covers half the face. Most famously these masks are attached to a long stick and held up to the face with one hand. These masquerades started out as festivities enjoyed by royalty, but later, Italy adopted the tradition as a way to celebrate public festivals. This costume is easy to put together because anything goes. Wear bright festive clothing that is mismatched and over the top or don a Victorian dress or suit. The key to this costume is the mask attached to a stick which will allow you to stay in costume and devour loads of candy at the same time. Mark Twain is the master storyteller whose books, short stories and essays entertain still today. Filled with rich characters, detailed plots and political commentary, he was a true master of writing. Like the characters in his story, Mark Twain has a look and personality that is unique and striking. For this great costume, you must find a white wig that has a fluffed disheveled look just short of Albert Einstein. A bushy, southern mustache of the same color is required as well. Any type of suit will do as your attire, but you must have a black bow tie. For props, you should have a cigar and one of his great novels to carry around with you. These are just a few of the many great costume ideas you can find from Executive Essentials online catalog of pens. So go ahead and get inspired. And have a safe and happy Halloween.